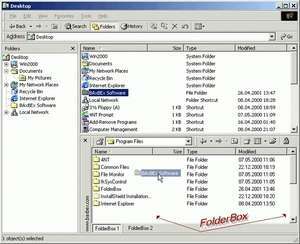 FolderBox is an free extension for Windows Explorer. It displays additional folders in the lower part of Explorer, which enables you to display the contents of two or more folders at once! Within a FolderBox you can copy and move, open and delete files, just as usual. FolderBox supports the typical drag&drop handling of files. Version 1.00 is a freeware program which does not have restrictions and it's free so it doesn't cost anything. For security reasons, you should also check out the FolderBox download at LO4D.com which includes virus and malware tests. Additional screenshots of this application download may be available, too. This file download is licensed as freeware for Windows 98 and higher.